The U.S. women’s hockey team were so close to pulling off what would have been a very fun comeback. They controlled the majority of their final group-stage battle against Canada—which didn’t really matter but served as a preview of the expected gold-medal game—but the Americans still found themselves down 2-0 after a couple of second-period mistakes. 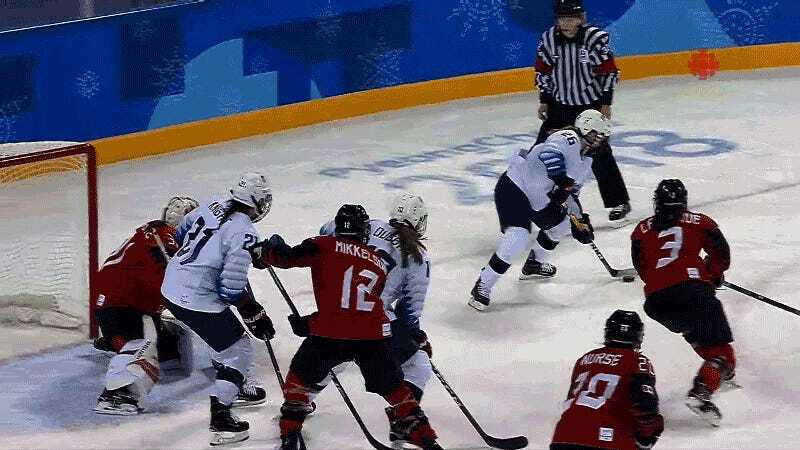 Still, a sweet, speedy goal from Kendall Coyne early in the third made the deficit manageable, and it looked very much like the U.S. women were about to do to Canada what Slovenia had done to the U.S. men. An equalizer never came, with the Americans’ attacking efforts hampered by a couple of late penalties. The final minute, however, was a mad scramble in front of net, highlighted by an absolutely perfect chance for Hilary Knight (seen in the GIF above) that she whiffed on. Canada won, 2-1. But that’s all right. Just don’t do it again in the final. USA Men&apos;s Hockey Loses To Slovenia. Slovenia! Does The IOC Have An Issue With The Statue Of Liberty, Or What?